"This image captures the essence of a hangover. It was taken at the ATP festival bar on the last morning, and they look like I felt—it had been a crazy three days." 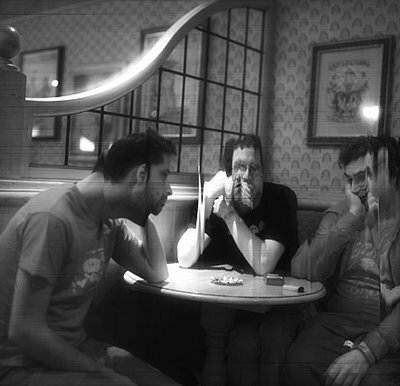 Taken by Michael Golembewski with the Magic Lantern Scanner Camera (right). There are some really wacky pages on the web, and the "95% of everything is crap" rule certainly holds. But the occasional exception can be fascinating, educational, entertaining, even brilliant. All these words describe Michael Golembewski's Scanner Photography Project. 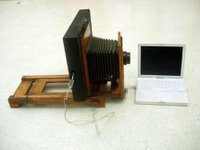 Golembewski, who calls himself an "artist and interaction designer," makes his own digital cameras (he's made ten or so) by combining old film cameras with the guts of cheap flatbed scanners. That's interesting enough, but what's far more fascinating is what happens when he uses the cameras. Moving objects and the motion of the scanner sensor create "distortions are similar to the effect created by moving a sheet on a photocopier mid-copy, except that they extend into three dimensions and only effect objects in motion." People morph into strange globs or acquire extra heads; cars and trucks are abbreviated to narrow posts in the middle of the street. The effects are odd, disturbing, and not infrequently beautiful. I love the garage door image (two thirds of the way down the page) that Matthias Wandel (geek extraordinaire) made with his flatbed scanner camera several years ago. Mainly about who owns some historic negatives and the legitimacy of how they are currently reproduced.